This article originally appeared in the North Island Gazette August 29, 2013. In 1910 Bernt Ronning, a young immigrant from Norway, established a homestead on the wagon road between Holberg and Cape Scott. Ronning cleared his five acres of forest. An avid gardener, he obtained many plants and trees through mail order catalogues. He became known around Northern Vancouver Island for his spectacular garden with botanical specimens from around the world. He promoted an agricultural fair in the San Josef area for many years. 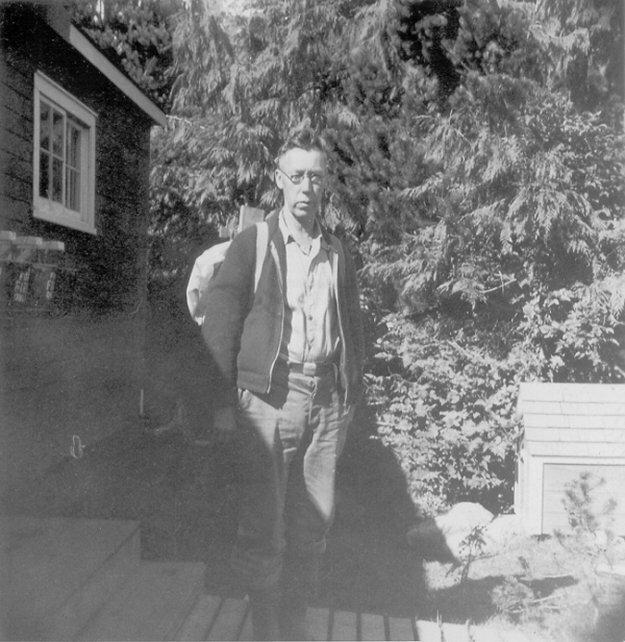 Ronning enjoyed socializing with his neighbours, and would hike out to Cape Scott to visit the military base there during the 1940s. The 10 minute walk from the parking area to Ronning’s Garden follows a restored section of the old Cape Scott wagon trail. The central location of his property on the Holberg- San Josef road made it a natural meeting place. He had a pump organ and had a building with a hand-hewn floor that served as a dance hall. As was the custom at the time, people would travel great distances, from Cape Scott to the areas around Quatsino Sound, to attend the dances at Ronning’s property. Ronning ran a trapline at Raft Cove. At one time a shipwrecked crew stayed in his shack until they were rescued. Working as a fisherman, trapper, and camp cook, Ronning lived on his homestead until the 1960s, passing away in Vancouver in 1963. When he left the rainforest began to encroach and take over the garden. One of the main features of the garden is an impressive monkey puzzle tree. Originally there were a breeding pair of mature trees (one male and one female), which marked the gate to Ronning’s property. Sadly, the female tree died about ten years ago. The offspring of these two trees were shipped around the world and can be found in many North Island gardens. Between 1981-2003 over 15,000 seeds and trees were sold or given to visitors and shipped to nurseries and buyers around the world. There now are 17 younger trees, offspring from this pair, who are growing now in the garden. One of the truly incredible features of the garden is the mature specimen trees, some of which are almost a hundred years old, growing amidst the wilds of the Pacific Rainforest. Incredibly, a number of smaller plants did survive for decades and have been revived through the vigilance of a dedicated group of local volunteers who wage a constant struggle to keep the natural environment from recapturing this landscape. Though much of the original beauty of the garden has been lost, including many shrubs and flowering plants the garden is still one of the incredible gems of the North Island. The road to Ronning Garden is marked on forestry road maps and with road signs. The garden is open year round, and many of the plants are labeled to help visitors appreciate the garden.